Goon Road is the name of an actual road located in Fairview Heights, Illinois. Goon Road has a haunted history, and was also the go-to place for partying and drugs during Nick Menn's teen years. The project will be conceptually based on the dark history of the road, as well as heavy drug usage, wreck-less behavior, and life's hardships. It is meant to blur the perceived lines between reality, life, and death. The album will be split into three EPs to match the three distinct hills on the actual Goon Road. (each EP will be referred to as a "HILL") With many layers and symbols spread throughout the expansive project, it will give listeners a chance to find something new with each listen. When asked to describe the overall concept in a recent interview, Nick Menn said "to me, Goon Road is the perfect American, drug-induced horror story. The 3 EPs, or 'hills', represent the ups-and-downs often exaggerated by the choices we make in our lives." The First EP, or "Hill One" is considered as 'the set up' Hill for the rest of the album. In his teen years, the first hill of Goon Road would be where all of his friends would meet up to party. 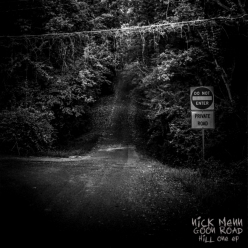 Hill One consists of Nick and his friends first encounter with road in itself, as well as songs centered around partying and drug use, like "Drug Induced" and "Nocturnup". The title song "Goon Road" lays the story-line out for listeners, painting a picture of the landscape, history, and the killers that lurk in Goon Road's forest. Paranoia and panic set in for Nick and his friends throughout the first EP, as the drugs and the haunted element of Goon Road work their magic and set the tone for the rest of the album. The project features production from STL heavy hitters KoKo of Basement Beats ("Shake Your Tailfeather", "Over and Over"), Tech Supreme, Urban Legendz, Matt Sawicki, ASurms Music, and Bentley Hendrixx. It also features guest appearances from fellow Doorway member SD TheDizzleMan, and fellow Force members and STL powerhouses Tef Poe and Rockwell Knuckles. Travel with Nick Menn and his Goon Road cast on the Hill One journey. The first installment of Nick's 3 part series is sure to set the tone, leaving you wanting the other two instantly.